1. Why is Texas so important? As the old saying goes, everything is big in Texas and that goes for the oil and refining sector as well. According to Bloomberg, the Texas Gulf Coast is home to about 23 percent of the US oil-processing capacity. In the Houston area alone, the refining industry can process more than 2 million barrels of oil a day into various fuels like gasoline. That’s bigger than Canada’s total refining capacity. The average refinery in Canada can process around 125-150 thousand barrels a day of crude oil. Just one refinery in Baytown, Texas – the largest in North America - can process 590 thousand barrels a day. 2. But Hurricane Ike hasn’t caused any damage yet? To protect their people and their plants, the refiners in the affected area decided to proactively close their facilities. 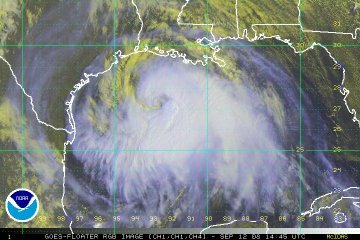 As a result, it’s expected that a fifth of the US refining capacity will be shut before Ike makes landfall. Add that loss of production to the after–effects of Hurricane Gustav when 10% of the US refining capacity located closer to Louisiana was shutdown and you have a situation where US refining capacity will be at a lower point than we saw after Hurricanes Katrina and Rita. Some of the refineries shutdown after Gustav have restarted, but the area is still not back to 100%. As with any commodity, a lack of supply often has an impact on the markets. 3. So why does the price of gasoline in Canada go up as well? Crude oil is a basic commodity used around the world and is traded on the same commodity exchanges as coffee beans and oranges, meaning that's where the selling price is determined. Crude oil is then run through a refinery to make gasoline and other fuels. Gasoline, having widespread common use around the world, is also a traded commodity. Depending on how much of both products are available, and how much demand there is, the price to buy gasoline at the wholesale level will either go up or down. This is somewhat complex, but relatively transparent as timely commodity information is readily available. This often works to our advantage in Canada. Our refining industry is small compared to the US and our population is one-tenth the size and spread out across the Great White North. By being market based and having an open trade border between us, our industry has to be competitive with the massive and efficient US refining sector. The downside, is when there are issues, we feel them as well. 4. If crude oil didn’t move much, why did gasoline prices jump so dramatically? As drivers, we are used to following crude oil and watching the impact on the pump price, but we often don’t think of gasoline as a commodity. It is. And just like Katrina and Rita, this is a situation primarily based on what’s happening to gasoline – not crude oil. If you watch the markets, you’d see that the gasoline price often follows the price of crude oil up and down. That’s not always the case, but they are a bit like dance partners. Sometimes, like today, the concern is more about the industry’s immediate ability to process the crude oil into fuel. That’s when crude oil quickly exits the dance floor and lets gasoline take a spin on the dance floor. I’m not going to predict what will happen because I don’t know. The important factor to watch will be how quickly the oil and gas sector in the eye of the storm can return to normal operations. Refineries need power to operate, so extended power outages could be problematic. And anyone who has experienced a flooded basement can imagine how much damage a flood of salt water could have on a large plant. The markets will watch this closely and will react to the news – whether it’s good, or not so good. I hope that has helped offer some perspective and understand that there may be more questions in the days ahead. Thanks for visiting our site. Why is it that the price of a barrel of oil has dropped from a high of 147$ to just above 100$ but the price of gas is still rising? Last January the price of a barrel of oil was 100$ and a liter of gas was approx. 1.05$. It can't all be attributed to Hurricane Ike and other storms. While I appreciate your attempt at explaining this "explosive" topic, I cannot agree with what is happening. When crude oil was at $140, that was the main cause for high prices. Higher crude = higher cost to produce. That makes sense. But when crude drops $40 and gas doesn't drop as much (and even went up right before Labor Day), there is something not quite right. When wholesale fluctuates 2 cents from day to another, we don't see a price increase (or decrease). However, if it jumps 12 cents (without knowing what the next wholesale day price will be), that's when gas goes up? My question is what will the answer be to high gas prices in the middle of December if oil reaches the same price as it did in December 2007 and there are no hurricanes but our gas prices still remain 20 cents higher than a year ago? Here's another good excuse to raise gas prices. What does Hurricane Ike have to do with refining in Canada? Answer: Nothing. Just another way for the crooks at Petro-Canada to raise prices. The price of crude has fallen 31% over the last couple of weeks yet the price of gas has only gone down about 8% where I live. Petro-Canada's motto should be " First to raise prices, and last to drop them"
I'm sick and tired of this money grabbing. Every oil company blames the rise to speculators and any natual dissaster in the world. It's time that the Gov steps in to control this problem. Stop with this green bull of riding bikes and commute, as we all can't be tree huggers and do this. Maybe if our Gov officials all had to pay for their fuel and not the tax payers, than maybe they will know what the average Canadian is going through. This is extreme gouging and nothing else.i just listened to a petro Rep On Cjob And he Was Full of Crap.we Dont Believe you oil Companies Because Wre the Buyewrs have Been Getting Ripped off. Dont Tell Us you only Make A Few Cents of A Gallon of Gas.Im Sure your Taking A Good pay Home So dont Give us that load of Crap. You Guys Are Just Greedy And Sick. When Crude Goes Up You jack the price Up Within Seconds,But Why is it when Crude Drops you give us Some Crap And Say the price isnt reducing Because it Doesnt effect the price.good things you Can Carp From Both Side of your Mouth Mr petro boss.You Oil Companies Make Me Sick. Why is that gasoline prices "leap up"but only "trickle down"?When the danger passes,as I'm sure it will,prices should drop just as drastically. As a guy with a major city as his last name, it's nice to hear from you. I did have to edit your comment slightly to take out a few unacceptable words (see comment policy), but left it pretty much intact. We do offer several fuel efficiency tips on the site, realizing that not everyone can ride a bike or take transit as you pointed out. The post above talks about the reasons behind what has happened recently with pump prices - essentially the wholesale price of gasoline went up dramatically. As well, my comments above link to a description of the relationship between crude oil and gasoline prices that you may find interesting. As for the Petro-Canada spokesperson on CJOB, that was me on the Charles Adler show. I answered his questions and stand by what I said. Charles himself asked if anyone believed what I was saying. I said I appreciated that people can make up their own minds, but they should have the facts to do so first. I do remember that post. Here's the thing - Hurricane Ike hasn't even hit Texas yet. We haven't even felt a blip regarding fuel shortages. And yet the price has gone up. I can understand price increases due to factors, but it's the amount of the increase and how quickly it's reflected in the pumps. If there were price drops that were as significant as price increases, I'm sure the intensity of arguments would be diminished, but that's not the case. My question would be: how is an increase in wholesale price calculated? How is it justified to send it up 12 cents instead of say 6 cents? I'm glad to hear you've been to Pump Talk before. If you go to the Bloomberg article I linked to, you can see that the refineries were shut down prior to the Hurricane reaching land. And not just a few. 19 percent of US refining capacity is essentially closed with no firm start date. Take the Hurricane out of the equation and picture several large refineries shutting down all at the same time. When it comes to commodities like gasoline, supply disruptions can impact the marketplace. As for the amount, it's not a number pulled out of the blue. If you follow gasoline on the commodity markets, you'll get a good sense as to where pump prices may head. I'm interested in tracking the gasoline on the commodity market, so where can I see the prices? I looked at http://money.cnn.com/data/commodities/ and I see Unleaded Gas, but that's for Oct '08. Is this the one that you are referring to? Also, I appreciate your quick and thoughtful responses. I listened to Mr. Hamilton on "Adler On Line" trying to explain the increase in gas prices due to Ike. I suggest you need a new PR guy. The explanation, and yours on this web site do not add up. Sure oil is a commodity and so I suppose is gasoline. However, Petro canada determines the price of gas at its stations. You paid $x/liter and filled the tanks at my local station. Regardless of any "excuse" about Ike or commodities (that's what they are - excuses) the cost of that gas at my local dealer should be dependent on the price you paid to fill his tanks. When you fill again, deal with your prices but admit what it is - price gouging. How else can you explain the huge profits for oil companies over the past year? Do you have to increase prices at my dealer's pump even before the higher priced gas gets to my dealer? If so, please explain why you - Petro Canada - must do that. Thanks for the comment. Sorry for the delay in getting back to you as I had to shut down the computer and go pick up my kids. The CNN link is good, but it's hard to get a sense of the day to day movement. Also, there's unfortunately no definition for Unleaded Gas so I'm not exactly sure if it's the right number to follow. I used to use a great page on the Globe & Mail site but it doesn't seem to be working. I'll talk to the pricing guys on Monday and see if I can get a worthwhile link for you. Many of the good ones you have to pay for. I'm the same guy you were listening to on Adler Online this afternoon. The answers I gave were the same as I wrote for this blog so if you didn't like one, it's not suprising you didn't like the other. Explaining a large jump in the price at the pump is never easy. I get that as I don't like paying more for anything, including gasoline. I believe that when people have questions, and someone like Charles Adler gives you an opportunity to provide answers, you take it. You may disagree, but that doesn't mean what I said was untrue. Profits are based on a number of factors as Petro-Canada is an integrated oil and gas company. What we make at the pump is actually a small portion of the overall profit. I cannot think of another instance that we as consumers have put up with the criminal behaviour that we put up with from the oil companies. We just sit here and take it over and over and over. Hurricains, wars, possibilities of natural disasters. That would be like farmers saying, "I think we are going to have a draught next year. Lets hike the price of grain this year to make up for it" It is CRIMINAL! And I am frustrated! This is a very serious matter, that why is it happening again and again. Why the price of petroleum is not going to be stable. I think it is an unsolvable question. Any one has answer of it? I've often said there is a world of activity occuring behind the pump price. The explanations are never simple, but they are always based on what's going on on the markets at any given time. I don't have a degree in Economics, but I understand the basic laws of supply and demand. They apply to any commodity. Gas prices move up and down depending on what happens in North America and sometimes around the world. That means the reason is often different from one day to the next. That fuels confusion and distrust, but it doesn't mean that anything untoward is occuring. At this point in time, many oil companies are profitable. But the refining sector hasn't fared very well for a good chunk of the year. I don't expect sympathy, but it just shows how difficult it is to manage billions of dollars of assets and operate in a difficult business environment that is beyond your control. We are all free to believe what we want to believe. To me, if I am going to believe strongly in something, I want the facts and answers to my questions. That's what we try to do with this blog and other efforts. People are free to make up their own mind from there. It would be a boring world if we all agreed. For those who really want to believe that there is something more going on, I offer you two thoughts. First, even the markets where prices are analyzed and regulated by the government have raised their pump prices. Same fundamental reasons. Second, this industry has been studied and studied some more. The result is always the same - the world of gas pricing is confusing, but it serves consumers well. The attached list is a little dated, but it highlights the 20 or so studies that were done over a 20 year period. Jon, I pity you. It seems that you are one of those highly paid PR people and spin doctors that the oil industry has employed to give itself legitimacy. You have all been very smart in how you have conspired with each other to stop any competition with each other which might bring prices down and how to increase the prices in such a manner that will psychologically get the average person to accept the increases. However, I believe you are fast approaching a point where the populace is no longer going to be duped. At one time, getting over the psychological cap of $1.00 per litre was the challenge and you have managed to overcome that extremely well. But, from all of the grumbling that I am hearing and also experiencing myself, I feel you may have gone too far with the current outrageous prices. The architects of your master price increase plan may have to go back to the drawing board. We have an election looming. Hopefully, the numbers of educated Canadians will help to create an issue of the pump robbery that is occurring just as the oil industry has been able to create an issue of mythical shortages. Your responses are polite and pleasant but I, for one, do not buy them. I will also be holding my member of parliament accountable for the increases and will be voting for a candidate who will look after my interests, not yours. I am, sadly, still hoping that an "honest" candidate will present him or herself. What percentage of oil used in the USA is produced in the USA? Gee, Ike must have steamrolled through a bunch of other places before it got to Texas, given the small percentage of 'homegrown' oil used in the USA. On Monday Sept 8 in Phoenix the price of gas was $3.39 a gallon. On Sunday night it was $3.38 after the hurricane and Monday morning I checked gas buddy and it still hasn't moved. It seems interesting that the American consumer who is much closer to Texas is not affected while Canadian prices are hiked. Jon, your patience is admirable; you must have thick skin. I would like to encourage people to at least read the blog entries, maybe do a little research on oil and gas pricing before you post your rant. I've read through all the comments, and they all repeat each other. Wow Anon you must be looking for a job with Petro Canada. You seem to know something the rest of us don't, please enlighten us with your widsom. Or maybe you are just another PR guy???? So, I have a question today. Wholesale gas has dropped 6 cents, from 102.30 to 96.30. Yet, the retail price has only dropped 2 cents. How does that work? I have monitored wholesale vs retail for a while, and seen the correlation, but it seems today that has broken. Can this actually be chalked up to retailer gouging or greediness? Or is there something else at work? In the first week of September, Pump Talk turned one. In creating this blog, we set out to help provide answers to many of the questions that people have about gas prices and share fuel efficiency tips. Readership continues to grow and the site has evolved and improved a great deal since the first post on September 6, 2007. If you've read through the archives, you can see that we've covered a lot of ground in 12 short months and tried to answer the many questions we receive. We've also tried to lighten up the discussion at times as I believe that a defensive and angry back and forth turns off most people who just want to know what's going on. Social media, as I'm sure you've heard many times, allows us to be part of the conversation. We will continue to answer questions and offer perspective to help readers understand what's going on. And just like any good conversation, we don't all have to agree. That would be boring. I look forward to seeing where the conversation goes from here. However, any explanation you can provide would be greatly appreciated as always. I work in the Oil and Gas Industry in Alberta and I'm embarrassed with Petro-Canada's response to the quesions regarding high gas prices. Rather than answer the questions with honesty and respect, it seems that they feel the consumer does not have the intelligence to fathom what is happening here. For example, how can anyone at Petro-Canada defend the gas prices over the last few weeks. Fact - Petro-Canada ran out of gasoline at several stations across western Canada. This is a shortage of supply. Decrase in supply while demands stays constant shoudl result in an increase in price. No price change was evident. Fact - when an expected (percieved) change in supply in the US occurrs due to Ike, prices increase dramatically. However, there has been no change in local demand, nor a change in local supply. I don't care how much we pretend the gasoline markets are connected, they are not. Alberta is a net exporter of Crude Oil but Alberta does not export or import Gasoline to the United States. the US and Canadian standards for gasoline make them unsaleable to eachother. It is embarassing to defend these price increases by anything other than Petro-Canada will set the price at what the local consumers are willing to pay; that is, they are out to maximize their profits...and are legally mandated to do so as a corporation. Whether one beleives this is right or wrong is another question. However, I beleive the BS abiet polite PR responses from Petro-Canada are inappropraite and border-line unethical. Because of this, and this alone, I will elect not to use Petro-Canada for my fuel needs (because that is the only thing Petro-Canada or any other business will listen to anyways).